bug, and 30 to 40 percent of them have already died. leave very few options for treatment. market because they can achieve higher prices there,"
command very high price premiums,"
known as trench fever, spread through body lice. these precious drugs, experts said. — Senior author Dr. Herman GoossensSenior author Dr.
Antwerp, in Belgium. "We never expected this." contacts within a household or a hospital for months. decisions you make about what to give that patient,"
It seems a bit like proving the known. between antibiotics and antibiotic resistance. researchers knew who received which. 60 per cent of streptococci and at six months, 50 per cent. those infections might not respond to antibiotics. affected people more vulnerable to resistant infections. medicine at Foothills Medical Centre in Calgary. that's a major cause of hospital-acquired infections. Except she hadn't been hospitalized. (PVL), which has been linked to MRSA, last October. and that these were cases of hospital infections. health problem too widespread to ignore. 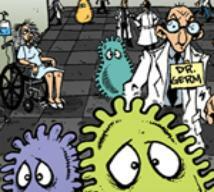 the next drug-resistant infection epidemic. on their watch from drug resistant infections that they most likely gave the patients in the first place. !!!! !Don't them ditch your loved ones to the nursing home to die!!!!! Prevention (CDC) isn’t leveling with the public about it. How Many Superbugs does it take? Nick Narron went into Jewish Hospital in Louisville Kentucky in June for heart surgery, which was successful. Nick had tested positive for MRSA, Acinetobacter baumannii, and Klebsiella pnuemonia. family to please just let him die. Treating one Superbug with toxic antibiotics only enables another superbug. growing threat, EU health officials said on Thursday. 50,000 die as a result. We're talking about a flesh eating bacteria called Vibrio. warnings about eating Gulf Coast oysters. some 30 cases have been diagnosed. p.m., she said, he complained of a sore throat. sees about six cases of epiglotitis a year. patient rooms -- may provide part of the solution. 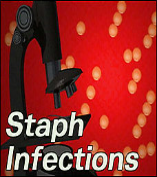 end up transmitting harmful infections to patients. dressing containing a seaweed extract. Medical Center in Baltimore, presented the results. of the rate we observed for A. baumannii,” he said. entered the rooms of patients with MDR A.
were independent risk factors for increased A.